This month’s block is the Yellow Tulip. I am not making one because I made an extra pineapple instead. Since I am not making this month’s block I thought I would layout my progress thus far. This is not the way they will be positioned in the end, but it is fun to see them all together. This could actually be dangerous, since I am doing this in the potholder method and they are all quilted and bound, I could technically stop here and make it a smaller quilt. Nah! I am in for the duration. I do love this quilt! 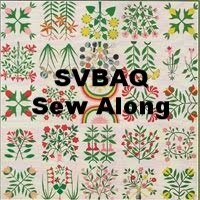 Check out the SVBAQ link (here) to see all the progress. Oh la la.... what beautiful blocks Wendy.... Oh la la ...I just can say that ! Congrats! It is so beautiful all laid out together!! The cheddar background is so very rich looking. I agree about the cheddar background - fabulous! Your blocks look amazing laid out together! I meant to say that I love your quilt and color choices, but how do you join "potholders" to make a quilt? It's looking very pretty--how fun to see the blocks all together! Wow, these blocks are so beautiful! It's fun that you're being a rebel and doing a different block this month. Lovely blocks, Wendy. I love your vibrant colors against that cheddar. 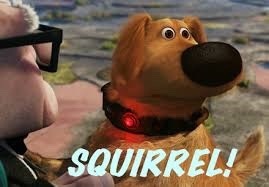 I continue to love your cheddar background. Your blocks are beautiful and by using your potholder method, you're going to be the first one done! I haven't taken a picture of my block yet. Fun to see all your blocks up for a picture. And I am glad you are in for the long haul. Decisions, decisions! Loving the way this is coming together! Wonderful fabric choices. 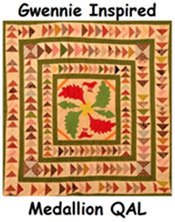 The cheddar makes a stunning background for your beautiful applique! love them! they really glow with the background - glad you are in it for the duration - fun to watch your progress. Thanks for sharing them all together, they look great! 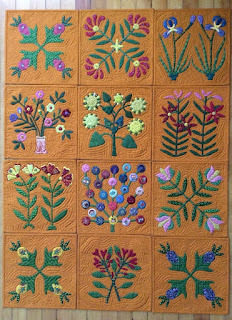 And you are a hop, skip and a jump ahead, having each block quilted and bound as you go! Love the background! I've been using a lot of colored backgrounds in my applique. I'm just bored with off-white. Can't believe I haven't checked your blog for 3 days! They are beautiful and you keep up so Faithfully!! Have been seeing them as they are made but when all together...WOW! Very nice! I like seeing all the blocks together. This project is breathtakingly beautiful! Your workmanship is always perfect. Makes me smile to see it. Stars in a Time Warp Finale!